Need to take an adventure with your taste buds and your friends? Well, that is what Creme & Sugar is all about. This is a place where you can order any combination of a sugar concoction drink or pastry that will completely blow your mind. The store has a unique vibe with retro decorations all along the walls. On the top of one of the walls, the biblical verse Esther 4:14 is written in beautiful calligraphy. The staff members are incredible and love creating a conversation with each of their customers and are committed to providing customer satisfaction. 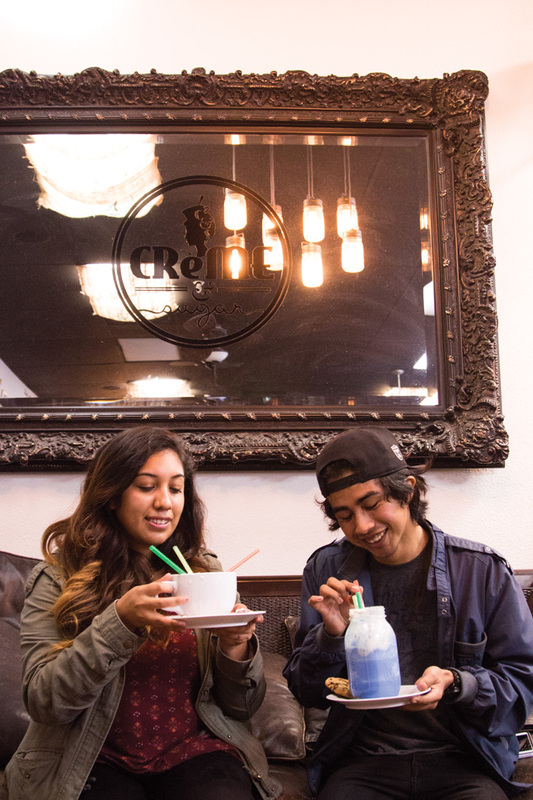 Creme & Sugar is a place for community, as noted by Joe Gonzalez, junior christian studies major. “It was a beautiful experience,” Gonzalez said. The entire coffee shop is full of an overwhelming amount of youth from Orange County and Riverside. The shop is located near a local high school and is always packed with young students and families who are excited to receive their treat. One incredible factor of this specific coffee shop is their menu that has a variety of options such as special teas, coffee and milkshakes. The most notable choice on their menu is the Unicorn Hot Chocolate. Presented in a huge white mug, the drink consists of marshmallows, sprinkles, whipped cream, candy, and sugar, and is perfect for satisfying a sweet tooth. “I really enjoyed the unicorn hot chocolate,” said Naomi Villagram, junior biology major. Their milkshakes are also displayed in a mason jar making their drinks photogenic for a flawless Instagram post. “I ordered the Secret Cookie Monster Milkshake which was the most beautifully crafted thing I have ever seen,” Gonzalez said. Aside from their creative beverages, the shop also sells magnificent cakes that are made in many different flavors such as lavender, animal cookie, and unicorn. The lively vibe during rush hour is evident as visitors feel the warm community all around them as people chatter and wait for their treat. “It’s a great place to go when you have free time and want to have some fun,” Villagram said. Even though the location is a 45-minute drive from the campus of California Baptist University, students will find that the small commute is worth it because of the amazing food, drinks and atmosphere.